View from the Birdhouse: What are eBay Collections, and How Do I Use Them? eBay now has a collections feature. 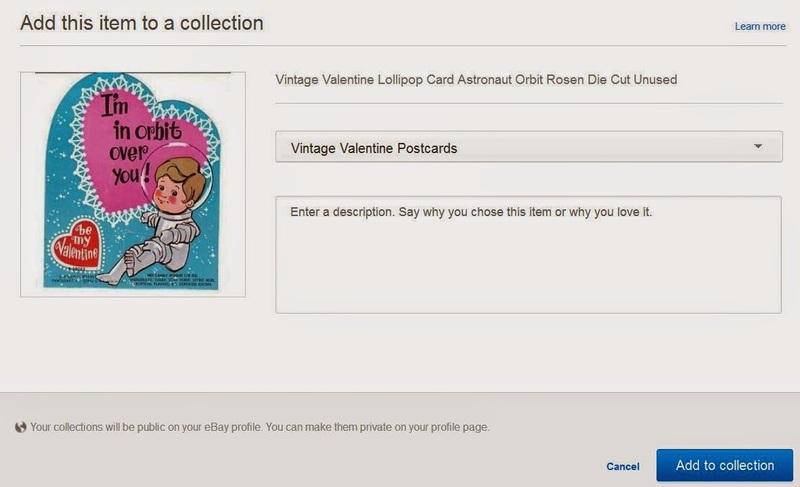 This is a fun feature with curated photos from eBay items, on a theme. You can browse collections that other buyers and sellers have made, or you can make a collection yourself. After you click on the "Add to Collection" option, the following will pop up. You can create a new collection by choosing a name here. It's easy and fun, and a nice way to save items that interest you. You can find all my collections here: eBay collections by Birdhouse Books. If you'd like to explore what an individual collection looks like, here is an example: vintage coloring books collection. I hope you enjoy the collections posted here. It's a fun way to visually enjoy some unique vintage items.